More than $400 billion in government contracts are set to expire this year across the largest 19 federal agencies, according to a recent report by big data and analytics firm Govini. That’s creating significant opportunities at some agencies to reorient federal programs in support of the Trump administration’s priorities, said Matt Hummer, director of analytics at the Arlington, Va.-based firm. 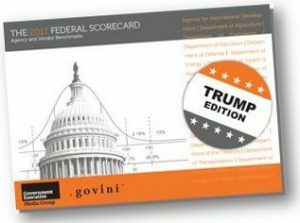 The report, the 2017 Federal Scorecard, is Govini’s annual ranking of government contractors and offers a granular picture of the relationship between agencies and the companies they do business with. It was produced in partnership with Government Executive Media Group. In addition to providing an overview of contracting activity at each agency, the analysis includes a “reprogramming index” that ranks agencies according to their potential to fund new priorities, based on the number and value of expiring contracts. The key takeaway is that at some agencies with the most politically-charged missions, the administration will be able to significantly redirect agency activities through federal contracts. Analysis: Who’s at risk from Trump’s priorities? For the Trump administration to make good on its campaign pledges to radically reform the government, agencies will have to reprogram dollars from some current programs. It was with that premise that the data analytics firm Govini launched an analysis of government contracts and spending at 19 federal agencies. 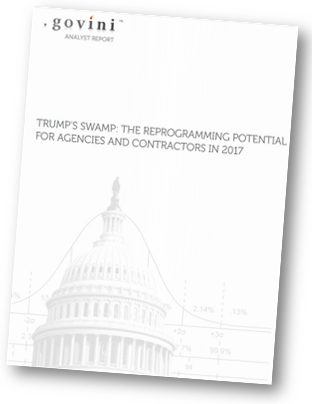 In a new report, Trump’s Swamp, the company looks at potential reprogramming at federal agencies and which agencies – and hence contractors – can turn the quickest to meet the priorities of the new administration. Govini determined what it calls “reprogramming potential” by looking at available spending and contracting competitiveness. Govini’s premise is that an agency’s ability to fulfill its mission and the priorities of the president is related to its ability to purchase goods and services that can put Trump policies into action.